Editor. Nationality: American. Born: Dorothea Carothers Allen in Cincinnati, Ohio, 1925. Family: Married the director Stephen Fleischman: one son and one daughter. Career: 1943—worked as messenger, then in sound laboratory and as assistant editor for Columbia; editor on commercial and industrial films before becoming feature-film editor. Awards: British Academy Award, for Dog Day Afternoon , 1975; Academy Award, for Reds , 1981. Address: c/o United Talent, 9560 Wilshire Boulevard, Suite 500, Beverly Hills, CA 90212, U.S.A.
Show (New York), May 1970. Wide Angle (Athens, Ohio), vol. 2, no. 1, 1978. American Film (Washington, D.C.), November 1985. Film Quarterly (Berkeley), Fall 1992. American Film (Washington, D.C.), December 1985. Interview with Vincent LoBrutto in Selected Takes , 1991. Between 1961 and 1981, Dede Allen reigned as American cinema's most celebrated editor. This period championed the auteur director and Allen emerged as an auteur editor, working with many of Hollywood's best auteurs (Arthur Penn, Sidney Lumet, Robert Wise, Robert Rossen, Elia Kazan, and George Roy Hill) and developing her own editorial signature. Her first important feature film (after 16 years in the industry) was Odds against Tomorrow . Urged by Robert Wise to experiment, Allen developed one of her major techniques: the audio shift. Instead of stopping both a shot and its accompanying audio at the same time (the common practice), she would overlap sound from the beginning of the next shot into the end of the previous shot (or vice versa). The overall effect increased the pace of the film—something always happened, visually or aurally, in a staccato-like tempo. When she started work on her next feature, The Hustler , the French Nouvelle Vague and the British "angry young men" films hit America. The realism of the British school and the radical editing of the French school made strong impressions on Allen. She credits Tony Gibbs's editing on Look Back in Anger (1959) as very influential. The Hustler employs a similar style: lengthy two-shots, unexpected shot/reverse-shot patterns, and strategically placed "jump cuts." "Jump cutting" helped launch the Nouvelle Vague, and before Allen began editing, Robert Rossen asked her to watch Jean-Luc Godard's A bout de souffle , one of the seminal films of the French movement. Although she felt the "jump cuts" were only partially successful, she incorporated the basic principle into The Hustler by using a straight cut instead of a dissolve or an invisible continuity edit. The combination of these two schools and the focus on character over a seamless narrative flow gives The Hustler its unique quality of realism and modernism. With Bonnie and Clyde (the first of six films with Arthur Penn), Allen further developed the principle of the jump cut by marrying it to classical Hollywood editing and television commercial editing. Instead of using the jump cut as a modernist reflexive device or a stylistic flourish, Allen combined its spatial and temporal discontinuity with a clear narrative and strong character identification (from Hollywood) and nontraditional shot combinations and short duration shots (from television commercials). Allen's synthesis of the Nouvelle Vague, the "angry young men," Hollywood, and television defined her other major editing technique, what Andrew Sarris called "shock cutting . . . wild contrasts from one shot to the next, which give the film a jagged, menacing quality and create a sort of syncopated rhythm." Bonnie's sexual frustration and ennui at the start of Bonnie and Clyde find perfect expression in a series of jump/shock cuts. The chaos of the gun fights and the immeasurably influential ending (which also shows Allen's debt to Eisenstein's montage) pushed screen violence to a new, visually stunning level. In short, Allen must be credited with bringing modernist editing to Hollywood. Whether labeled American New Wave or Postclassical Hollywood, The Hustler and Bonnie and Clyde stand as benchmark films in the history of editing. And like A bout de souffle, The Hustler and Bonnie and Clyde deviated enough from the norm to be originally perceived as "badly edited," a perception fully inverted today. Allen's "shock cutting" in Bonnie and Clyde produced two long-lasting effects: 1) the American public began to recognize and openly discuss editing as an art form; and 2) the standard was set for rapid editing in every subsequent action film. From Sam Peckinpah to John Woo, editorial pacing continually moved toward shorter and flashier sequences. Her influence also manifests itself in other visual media; television commercials, music videos, animation, and children's television compress many images into very short sequences. Almost every music video owes its rapid, nontraditional editing constructs to Allen. In retrospect, Allen expresses concern about her contribution to increased editing tempo—"I wonder if we're raising enough people in a generation who are able to sit and look at a scene play out without getting bored if it doesn't change every two seconds. We talk an awful lot about cutting; we talk very little about not lousing something up by cutting just to make it move faster. I'm afraid that's the very thing I helped promulgate. . . . It may come to haunt us, because attention spans are short." 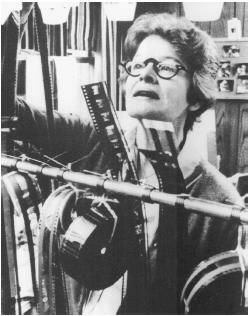 Allen continued to refine her editorial signature (audio shifts, shock cutting, and montage) through her subsequent films, especially the temporal and spatial jumps of Slaughterhouse-Five and Dog Day Afternoon (her first Academy Award nomination). In Dog Day Afternoon , after a slow, tension-building opening, the protagonist's discovery of the SWAT team unleashes a brief moment of chaos which Allen augments into ten, breathless seconds of screen time by overlapping audio, intercutting multiple interior and exterior locations, and employing jarring shot combinations and temporal ellipses. Since Sidney Lumet used a double camera setup on Al Pacino and Chris Sarandon during their phone conversations, Allen used various takes of each, which produced jump cuts and violated screen direction, but intensified their performances. In Reds , Allen combined documentary editing and her signature narrative techniques to weave a historical and biographical tapestry of refined complexity. This documentary/narrative blend won her an Academy Award. Since Reds , Allen's work remains consistently professional, especially in the usually overlooked dialogue scenes, but fails to convey the innovation of the sixties and seventies. This is not her fault. In the 1980s, not only did Hollywood become more an industry and less a developer of film artists, but Allen's techniques became fully integrated into everyday film and television editing. What once appeared radical became commonplace. When asked to edit The Addams Family , Allen needed to balance special effects, a greater emphasis on spectacle and set design, the demands of stars, shorter viewer attention span, a more cost-conscious Hollywood, and a script based on a 1960s television show. These constraints resulted in a polished film, but one with little of her signature, except for the loony glee of the vault slide and the intercutting of Gomez's train sequence. When working on independent projects, more of her creativity emerges. The curious jumble of edgy character interaction in The Breakfast Club and Let It Ride depends on the pacing her editing provides. In Henry and June , she experimented with fades and partial fades to blur time and point of view. Allen has co-edited most of her films since Reds with younger editors, providing invaluable training for them. Her mentoring of others has produced a new generation of top rank editors. After nearly 40 years in Hollywood, Allen's style, technical skill, ground-breaking films, and teaching secure her status as a legend of American editing.